When I sit down to talk with Gabriel Hubert (or Hudah, as he prefers to be called), one of the four trumpet players in the eight-piece Hypnotic Brass Ensemble, he is wearing a standard set of black and grey jeans and jacket, an unassuming outfit punctuated by a pair of carefully chosen bright red boots. He speaks with precision and concision on topics like entrepreneurship, education, and how to make a living in the music business. Now, he chooses his words carefully and doesn’t rush into a topic. But when I saw Hudah a week earlier, he was shouting “She makin’ it hot” over and over again onstage with a crowd of other band members over a funk-laced trumpet line. For the Hypnotic Brass Ensemble, a jazz-funk collective comprised of the eight sons of jazz legend Phil Cohran, the business of music is necessarily intertwined with the artistry: changes to the music have to be made in response to audience reactions and market size. In the band’s January 15 show at Hyde Park’s Promontory venue, this dynamism is obvious: when on stage by themselves, the band members sprawl out, remaining organized while each shows off his individual personality. But when the special guest of the evening, De La Soul, enters, the band finds a way to pack into a fraction of the space they originally took up, letting the 1990s hip-hop icons take center stage. While other musicians, especially those working in or near the jazz tradition, try to reject this problem of the audience or work against it, Hudah avoids the conversation by being upfront and pragmatic. He freely talks about the ways that the band has, at various times, added in or taken out elements of their sound depending on how audiences have reacted to them. But these changes in sound are never sacrifices—in fact, for Hypnotic, the way that the audience interacts with the music is integral. This almost populistic engagement with the audience, both as a market and as individual people, is part of what sets Hypnotic apart and adds social relevance to their work. 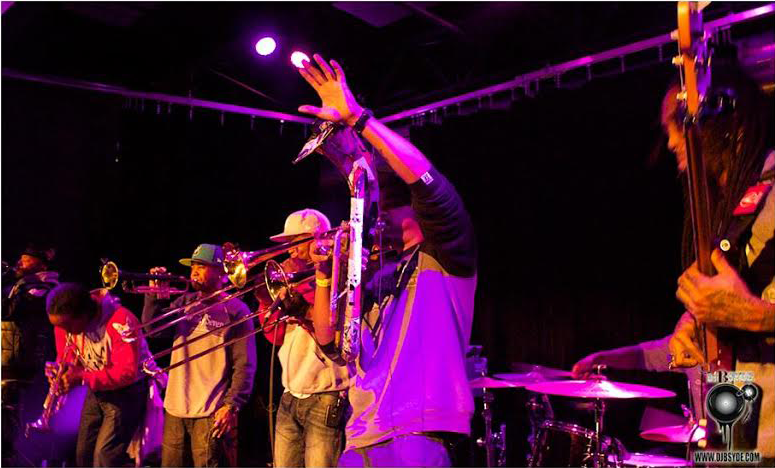 Now the band has returned to their home city to take advantage of the market here, supporting both developing musicians in Chicago and nationally renowned bands like Blur, Prince, and De La Soul, with whom Hypnotic Brass has lasting connections. When Hypnotic left Chicago they were still playing outside shops and on the streets, busking to make a living, but now they have the experience of playing venues like the Sydney Opera House. This experience, says Hudah, has given them an impressive network from which to gather collaborators for their burgeoning South Side Music Series, of which the aforementioned Promontory show was the first (sold-out) installment. Music has always been a part of the band’s life: having grown up together with a jazz deity for a father, they’ve worked as a band for longer than the members of some bands have been alive. They began as the Phil Cohran Youth Ensemble when they were children, traveling the world with their father and playing for luminaries such as Nelson Mandela. Cohran had all the brothers wake up at around six o’clock and practice on their brass instruments before school, a process Hudah described as trying for a child but eventually rewarding and integral to the band’s current dedication and ambition. Hudah also speaks openly about the period of time some of them spent involved in gang activity. He admits there was a period of time when the band members did “foul things,” a time when, as he frames it, they were using the hard work and discipline they learned in the band for something negative rather than positive. The turning point came after one day with a friend of his in high school. “One of my friends went home to his parents after hanging out with me and got a whupping at the age of seventeen,” he says. “If I’m that bad of a person to where a teenager almost in college life can get a whupping for hanging out with me, there must be something that I’m doing wrong.” This event and others like it drew the octet back together, and back to music. Now the band is committed not just to becoming renowned musicians but also to being role models to people—especially children—currently struggling on their native South Side. On their tours around the world Hypnotic has offered classes and workshops to children, teaching them about careers in music and the arts. Now, having returned to Chicago, they’re beginning to bring these same workshops to students in Chicago schools. They hope to offer an artistic path for children, one that reintroduces the power of music and art into the lives of African-American children for whom music has been taken out of school life. Hudah decries the current lack of the arts (especially music) in American education, and, more generally, pushes for what he calls the “education of self-determination:” an education that would teach children to pursue their passions and be rewarded for their interests. He’s quick, however, to dismiss the idea that he’s looking to change the educational system on a grand scale. “I would be beating my head up against the wall to try to change the system,” he says. Nonetheless, it does feel like what Hudah recommends and wants is a dramatic paradigm shift. The band recognizes the power they have to shift perceptions through their presence, both as positive role models and as counter-evidence to the prejudices against urban life in America. Hudah makes it clear that the band considers themselves ambassadors, “not just for the South Side, but for impoverished people anywhere on the planet.” He never hesitates to state the full scope of the band’s aspirations with Cohran-like grandeur: “Our goal,” he states, “is to become household names here in America. Once we do that, we can become household names across the planet.” He seems sure that that enormous goal is achievable, and with the drive and confidence that the Ensemble exudes, both on the stage and off it, it’s not hard to believe. Congratulations to all of the Hypnotic Brass Ensemble. Your gift of music to the world does indeed make a difference. You are Blessed by the Creator and a Blessing to all whose lives you touch.